The Oak Woodland Fire Fuel Reduction Project at Lake Hodges is an ongoing effort to return city lands back to a native habitat. The project is now funded by the Natural Resources Conservation Services, a branch of the USDA. The project scope includes removing eucalyptus, stands of arundo, castor bean, palms, acacia and other emerging invasives. The project began in 2010 with volunteers working on trees 6" diameter or smaller. In 2012, the project was approved by the City of San Diego for felling bigger trees. Though early on some big trees were felled by experienced volunteer sawyers, the work was switched over to hired contractors - Cal Fire, Black Sage Environmental, and Kelly and Associates once grant money came through. There are decades of experience with big trees, and with full time professionals work happens fast. Crucial for re-establishing native oaks and sycamores into the riparian corridors is the removal eucalyptus. Most of the large trees earmarked for removal are now gone. Many large specimen eucalyptus trees, as well as trees with a nest, have been left standing. The project is on schedule for planting lots of Sycamore and Oak trees (and more!). The top image was taken in August of 2014, before habitat restoration. The middle image was taken during the restorative process, in November 2015. Bottom image shows the groupings of oak, willow and sycamore that will become the landscape over the next 20 years. The dead eucalyptus will provide structure for birds while the sycamores grow to their full height. View to the water where soils are too rocky to support larger plants. Oaks will choose higher ground that has deep enough soils and the willows will claim the wettest spots. The Oak Woodland Restoration and Fire Fuel Reduction Project is something the community of Del Dios and the surrounding areas can be proud of. With the removal of the eucalyptus, the native trees and shrubs return, since they no longer have to compete for sun and water with the canopy of thirsty eucalyptus. Cal Fire crews working at removing downed trees. Any wood on the roadside is free for the taking. There are also trail closures happening that will temporarily impede the use of trails. We are using heavy equipment to remove dense patches of eucalyptus saplings and arundo. Please heed the signs and stay far away from the equipment – it can throw debris and hurt you if you are too close. Remove the invaders and the Natives move in. Native plants thrive once released from the effects of sharing the land with invasives. Water and sunlight are often better collected by invasives than our native plants because wildlife - animals, insects and fungus all depend on the native plants. As hosts and food to insects birds and mammals, native plants are at a disadvantage, leaving the invasive plants to grow faster. Suppressed native flora explodes once the invasives are removed. 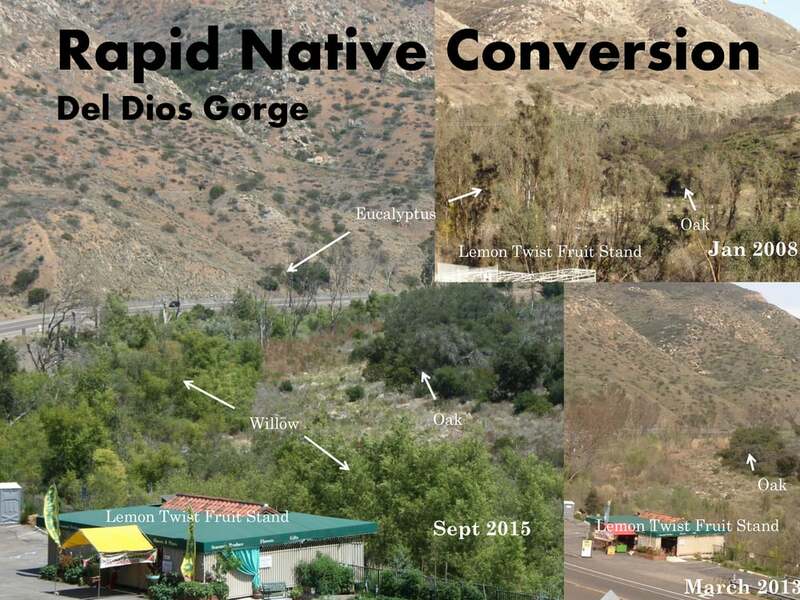 Pictures below from the Del Dios Gorge show the conversion of the landscape from eucalyptus dominated to native. In the section from September 2015 (bottom left of image), the willows and oaks behind the fruit stand have exploded with new growth - even in a drought. Project activities vary with the seasons. In Mid august, once the young birds have learned to fly, we start our invasive removal activities. Fall/Winter rains bring planting and work parties. Late Winter through Spring is about keeping ahead of weeds and planting more natives. Summer is all about bird nesting and watering our natives while they settle into their new digs. Native planting will be watered for up to 5 years, depending on when they show that they are establishes by either becoming micro-biologically enmeshed in native ecosystem or the roots go deep enough to reach the water table or both. Completion of the first phase of the project is planned for September 15, 2019. Got Acorns? We’d love to plant some!